Fun is not just for kids and young ones, even adults need and want it. At present times, To relieve us of our stressful life, we can resort to some fun. You don’t need and you don’t always have some sort of company for fun. Your android smartphone is your loyal companion not just to keep you connected with your friends, families or work but also fun. With fun, I mean real fun. Few apps on android are so funny that you can’t stop yourself from laughing. You just can’t stop it. In this article, we’ll be talking about some of the top funniest android apps including Talking Tom and alike. Talking Tom Cat 2 Free – This is the free version and is developed by Outfit 7. Most of such talking tom like apps have been developed by Outfit 7. In this app, Tom is a cat, naughty one. It responds to your touch. It also likes to make fun by repeating anything and everything you say in its own voice. You can even dress up this cat in various outfits or by buying hats, sunglasses, etc. This game is based on freemium model i.e. 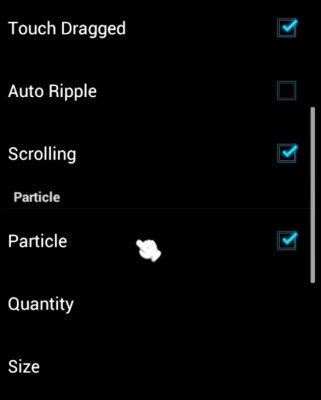 it is a free app but it has in-app purchase module for unlocking certain items. Download Talking Tom Cat 2 Free from Google Play Store here . Talking Tom & Ben News Free – Again this is free android app by Outfit 7. Here, we get two characters i.e. Our Tom (cat) and Ben (dog). Both are TV news personalities. They repeats whatever we talk to them in a funny accent. We can even be mischievous with them. We can poke them to make them fall from their chairs. Or just get them to fight with each other. We can even share their conversation on youtube or facebook, etc. 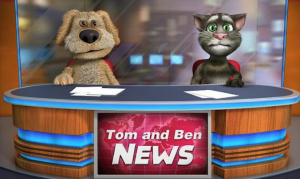 Download Talking Tom and ben News free from Android market here. 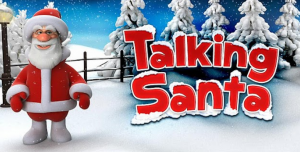 Talking Santa Free – Christmas is upcoming and so, for the fun of children who expects lot from Santa. Here we have Santa, a talking Santa. We can feed Santa and treat him nicely or play prank with him by throwing snowball in his way. Touch his bag to find out gift for you. You can even share 3D animation video greetings and christmas card with this android app. Download Talking Santa free from here on android phone play store. Tom Loves Angela – Now this is not just funny but also lovely android app. It is about love in air. The user talks to Tom. Tom repeats everything in his own accent to Angela who is his love. You can make Tom sing song to her, blow kiss, etc. Angela is intelligent character here and she responds to Tom by understanding his feelings. It’s in your hand to make the chemistry between Tom and Angela interesting. You can shake your phone to bring earthquake to their world. 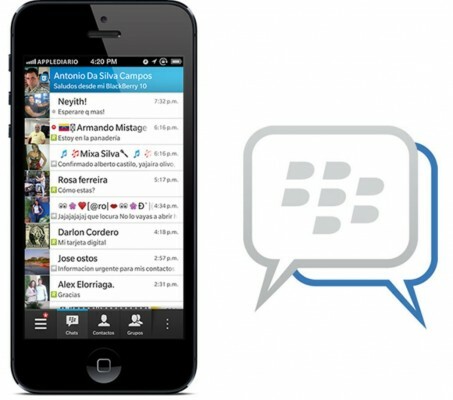 You can record and share their conversation and the fun with your friends or, say girlfriend on facebook or YouTube. 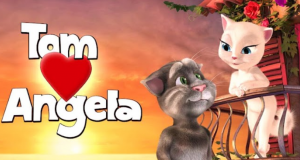 Download Tom Loves Angela for free from Google Android market here. Talking Pierre The Parrot Free – If you’ve been fed up with Tom and no longer wish to see him. We have a bird for your – The Parrot. Like parrots, it just doesn’t repeat words but also remembers some of your previously said words and say them randomly. Sometimes it also mixes all other words to create a new, hilarious, amusing sentence. It also reacts to touch. It is destructive and naughty and it’ll make its surrounding very disturbed if it is troubled much. It also dances when in happy mood. You can even throw tomatoes at him if you don’t want to tolerate its nuances. 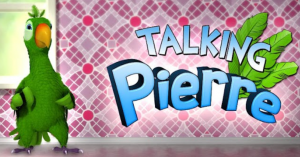 Download Talking Pierre the Parrot free from android play store here . These are just few of the many funny android apps similar to Talking Tom Cat. Just search for Talking Tom in Google Play Store and you’ll see a list of all similar android apps. Install as many of them as you want. Some of apps will download additional content to run after installation. The paid version of these apps are also available. The paid version doesn’t contain ads and unlocks many of the in-game components.